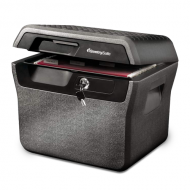 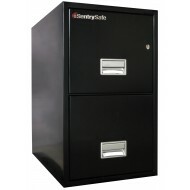 This Sentry fire file security chest is set up to store hanging files. 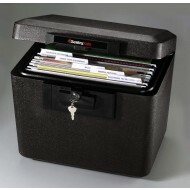 It provides, protection from fire and water for your important documents.. A continuous 360° jamb and waterproof seal completely insulate the interior from the threat of water invasion. 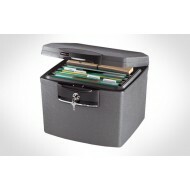 This is an ETL verified water resistatant feature. 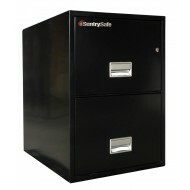 In addition, ETL has rated this security chest for 1/2 hour of protection of media such as memory sticks and CDs. 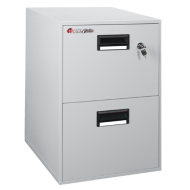 The H4100 also carries the UL 1 hour fire protection label for protection of documents. 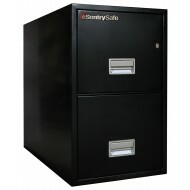 The Sentry 2T2500 two drawer file cabinet is a vertical file with 1 hour fire protection. 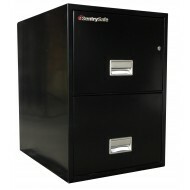 This file cabinet has a 1 hour fire protection label from UL, Underwriters Laboratory, and independent testing facility. 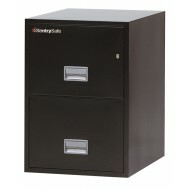 This is a ruggedly built file cabinet with rugged suspension for drawers making them easy to access.